A stretch of Hadrianls Wall on a steep slope, with turrets and an impressive milecastle, probably built by the Second Legion. Accessible from Cawfields Quarry car park. One of the best photo points on the wall. 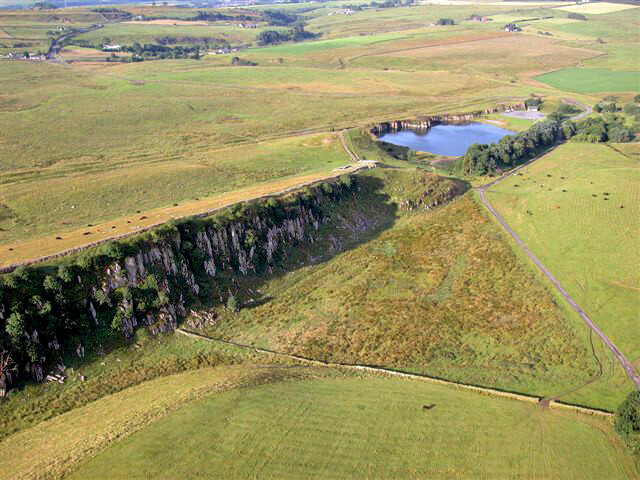 The car park is by a quarry lake that has resulted in a large piece or stone hillside being removed that once had a piece of the wall running over it. The wall now runs up a very steep rock face then comes to a stop at the top, just before a large fall into the lake below. You can walk up the slope by the wall and reach a point at the top where there is a small barrier, some people climb over the barrier and walk along the top of the wall to look over the lake. From the top and the way up you can look back down both at the wall and at a mile fort, giving a near aerial view. You also have a good view of a further section of the wall. While Hadrian's Wall does not go in a straight line it keeps to the highest ground in a fairly constant swish as it runs around the hill top, so at many points like this it goes up very steep hills and down again, when had they wished, they could have saved the need to do this by following the contours or moving slightly to the north at these points. The advantage is that it is defendable from attack from both sides, in front and behind. Sycamore Gap and Castle Nick and Steel Rigg are other points nearby where the wall does some serious climbing and falling along the route chosen so as to keep to the high ground. You can see the wall behind following the high ground. Getting there: The car park is pay and display, accessible from a small road, see the map for its location. Access: I think its open all the time. Charges: Free, but pay and display in the car park, blue badge holders free.